The iPhone 5S is shaping up to be an incremental update to Apple's smartphone line, not a major revision, with newly leaked photos that may be of the forthcoming phone in pieces adding to that theory. 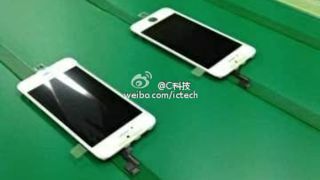 The pictures supposedly of an unassembled iPhone 5S, compiled by SlashGear, reveal a device with similar dimensions and features as the existing iPhone 5 model, and very few noticeable differences. All of this information backs up recent rumors about Apple's next iteration of its smartphone. Previously, it's been hinted that iPhone 5S will have a dual-LED flash for its rear camera and a slightly beefier 5.92 Whr battery, an upgrade over the 5.45 Whr battery of the iPhone 5. While there have been multiple leaked photos of the purported iPhone 5S dual-flash LED, we're still waiting to hear about the camera upgrade and if it indeed has a 12-megapixel snapper. The other lingering questions are if it will have an updated processor like the iPad 4's A6X or jumped to the next in line A7, and whether it will contain an anticipated fingerprint sensor. Beyond the iPhone 5S, change may come to Apple's hardware through a completely different device if the always-rumored, never-fulfilled iPhone mini shows up as a low-cost model. Much to the delight of iPhone accessory manufacturers, the screen size and volume buttons of the iPhone 5S appear to be the same as last year's model. Instead of dramatically changing up its hardware formula, Apple looks to be investing all of its revamping energy into the operating system. The Jony Ive-developed iOS 7 has cleaner-looking icons that remove all of the gloss and texture that has existed since the smartphone line's launch in 2007. It also has helpful new features like Notification Center so that users don't have to exit out of an app to change minor system settings like brightness or toggle Bluetooth connectivity. iOS 7, along with the iPhone 5S, are expected to debut in September. And with the deluge of manufacturing photos getting less and less blurry, that launch date must be getting closer and closer. Read how the iPhone 5S Home button may get some tweaking for a fingerprint sensor.